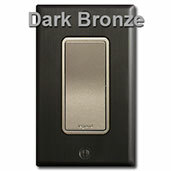 Get a high-end look with decorator nickel electrical outlets and light switches in beautiful metallic finish. Choose from stylish satin nickel silver outlets, tamper-resistant GFCI receptacles, rocker switches and dimmers that will lend your kitchen or bath an upscale air of sophistication. Mirror walls don't have to have mirror wall plates. This homeowner installed nickel silver outlets and matching metallic nickel silver covers on a mirrored kitchen backsplash and the results are stunning. These kitchen outlets are easy to locate and the satin metallic covers won't get covered in visible fingerprints the way shiny plates do. Pass & Seymour's metallic nickel finish blends perfectly with these granite counters and coordinating warm gray cabinets. These glamorous metallic nickel switches & outlets aren't just for luxury homes. You can create an upscale feel in a small powder room, formal dining room or silver bedroom. Looking for nickel toggle switches or duplex style outlets? 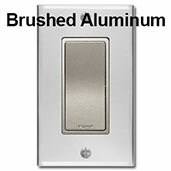 This new, specialty switch finish is only available on modern rocker switches and block outlets. All devices fit the same plate opening, which makes it easy to find the switch plate size and configuration you need. You'll love the nice, uniform look of these modern style devices. Simply swap out your outdated devices for these newer ones. 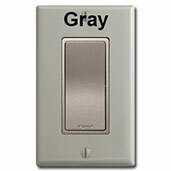 An alternative to nickel is gray if you're looking for regular toggle switches or duplex plugs. Need a Phone or Cable Hookup? 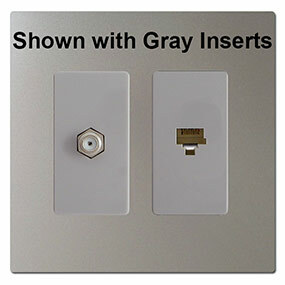 If you need a phone or cable port, you can use gray Lutron inserts. While not an exact match, they are the closest option. Buy gray cable insert here. Buy gray phone insert here. Interested in nickel switches but not sure which cover plates to pair them with? 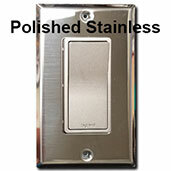 View images to see how they look with a variety of switch plate finishes. For an exact match in finish, get a metallic nickel cover. 6 sizes only. Note that plates in the metallic nickel finish are only available with rocker openings (1-6 gang), are plastic, screwless and slightly larger than standard size covers. For more configuration options, considering choosing another finish that blends with the nickel. 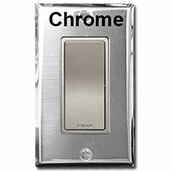 For homes looking to add some glamour with metallic paints, shimmer nickel light switches create the perfect finishing touch. The medium gray tone and elegant metallic finish make these devices blend beautifully with Kyle's dark bronze switch plates. 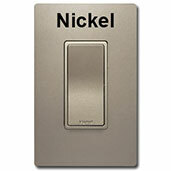 Nickel silver can also pair with stainless steel switch plates in luxury kitchens. Choose from over 300 sizes and configurations including standard, oversized, narrow, deep, short, and more. Stainless plates have a nice brushed texture, making them an excellent choice for high-end kitchens with stainless steel appliances. Swapping out old white switches with satin nickel silver polishes off the look. 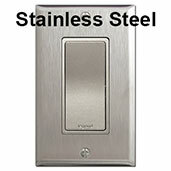 Cover nickel switches with polished stainless steel cover plates if you prefer reflective, almost mirrored switch plates. Another good choice for gray rooms is brushed aluminum plates with nickel devices. These plates offer a cool silver tone but aren't as industrial looking as stainless steel ones. A great choice for any room decorated in shades of silver and gray. We can't stress enough how much of a difference these nickel devices make in a bedroom or bathroom with their remarkable sheen, which is difficult to notice in the photographs but is even more alluring in person. 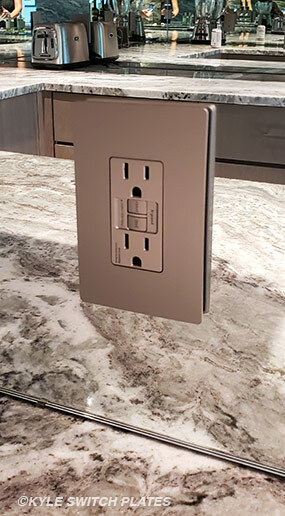 Gray wall plates are much cooler than these warm nickel switches, so you'll notice they don't blend together as well, but can still look nice if you're looking for contrast and have a wide range of silver and gray hues in your decor. With polished chrome plates having a reflective finish, they're much lighter in appearance than the nickel devices. They don't blend together as nicely as with the aluminum or stainless covers. 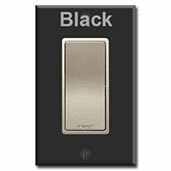 For contrast in a room with black and silver decor, you can add sleek black light switch covers to nickel switches. The results are striking. Perfect for dramatic bathrooms with black patterned wallpaper or a gloss-on-matte stencil wall. The black plates will blend in with your dark paint and the shimmery silver switches will match decorative elements in your room - a silver and crystal chandelier or framed wall mirror.